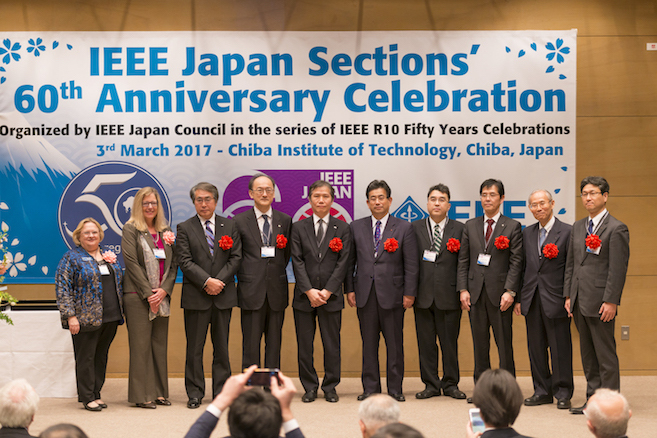 IEEE Japan Sections' 60th Anniversary Celebration was held on March 3rd 2017 at the Chiba Institute of Technology in Chiba, Japan. 91 delegates attended Japan SYWL Workshop and 230 people participated in this ceremony and reception, including the IEEE President, R10 Director, Executives, R10 section Chairs and Delegates. The celebration ceremony began with opening and greeting speeches given by JC Chair Prof. Toshitaka Tsuda and R10 Director Prof. Kukjin Chun. These were followed by congratulatory addresses by distinguished guests, 2017 IEEE President & CEO Karen Bartleson, MIC Japan Director General Yasuhiko Taniwaki, Past R10 Director Prof. Takuo Sugano, and JC-SAC Chair Prof. Yasuharu Ohgoe. The Japan sections’ activities over the 60 years since establishment and Japan 9 section chairs greeting were provided by video. 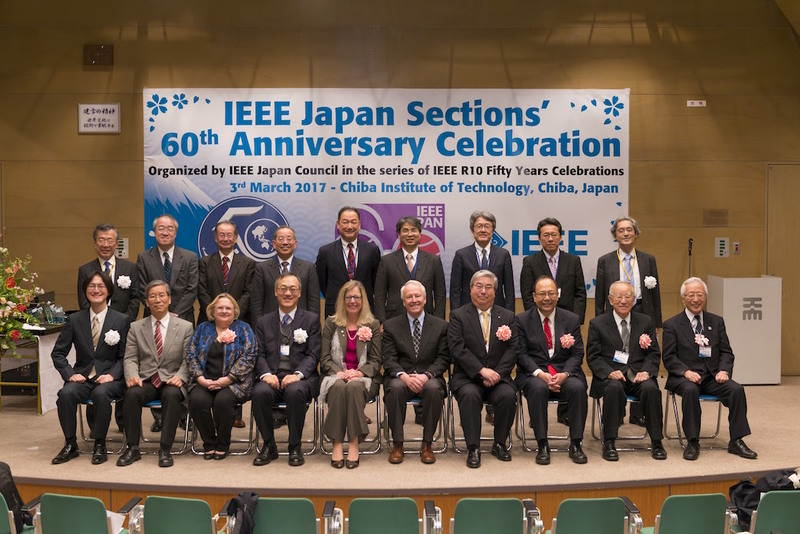 The 2016 Supporting Friend of IEEE Member and Geographic Activities (MGA) Award was presented to 8 companies in the Tokyo section for their long support of IEEE Japan sections. 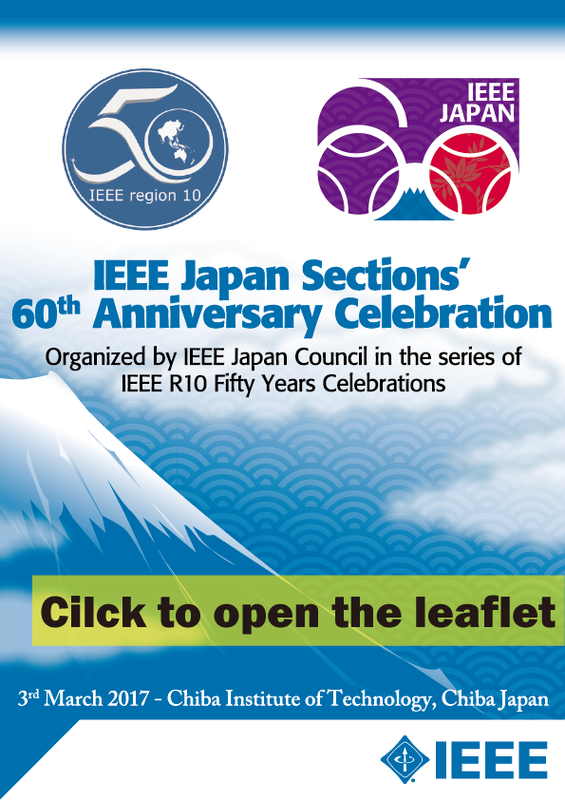 IEEE sections in Japan started as the IRE Tokyo section with only 50 members in 1955. Tokyo Section first covered all IEEE members in Japan and Japan Council was established in 1999. Now we have 9 sections and approximately 14,000 members. 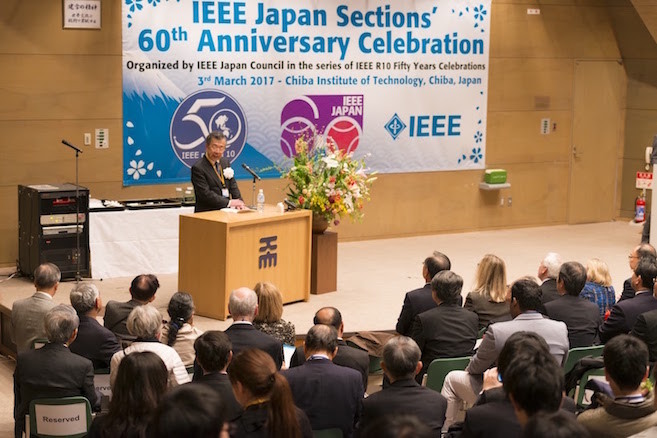 We will continue to make strong efforts to ensure that IEEE Japan sections’ activities are more enthusiastic and enjoyable. This will achieve our vision of contributing to humanity with science and technology. 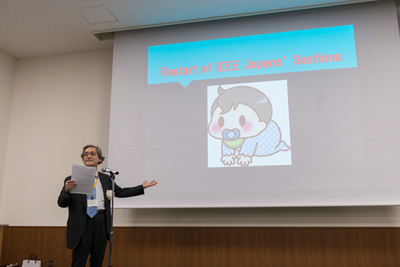 The reception started with opening speech given by JC Past Chair Prof. Tomonori Aoyama. He declared the Restart of IEEE Japans' Sections with stories of the Japanese 60th birthday "Kanreki" and traditional event "Hinamatsuri" on 3rd March in Japan. 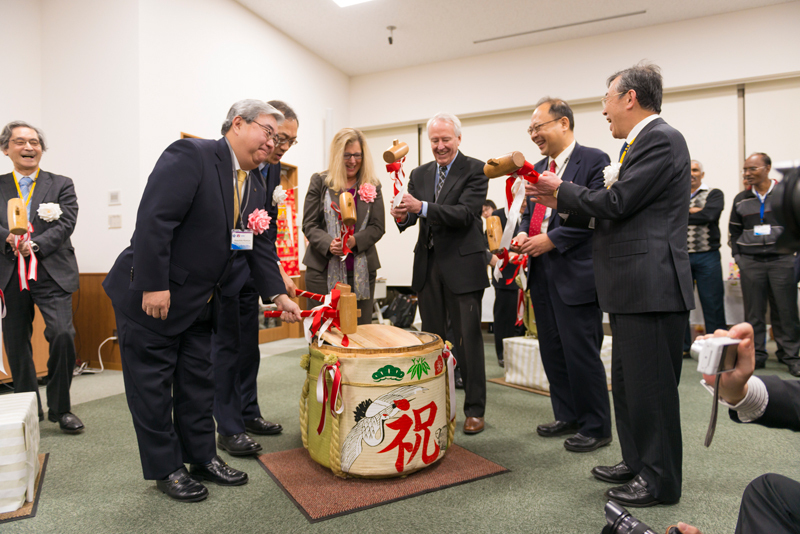 The guests joined Kagami-biraki” which is Japanese traditional sake barrel breaking ceremony to wish everyone prosperity and health. Also we held a local sake party and “Hinamatsuri” decorations included Kimonos, Cherry blossom, several beautiful Japanese patterns, etc. On this occasion, we deepened our friendship with the attendees from other countries, generations, positions and cultures. Japan SYWL (Students/Young Professionals/Women in Engineering/Life Member) workshop was held at 12:30 – 16:30 just before the Japan Sections’ 60th Anniversary Ceremony. 3. 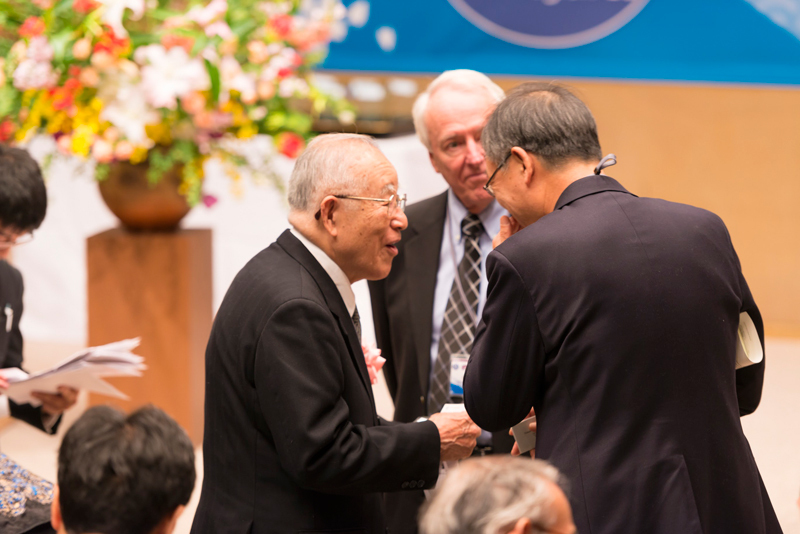 Discuss the role of IEEE for a better future and share ideas. The student members mainly lead the presentation and the discussion results were presented to the guests from R10 and IEEE Board of Directors. After the presentation, we discussed the information with them and various significant opinions and proposals were shared by all attendees. This SYWL workshop was started on Tokyo MAW 2015. 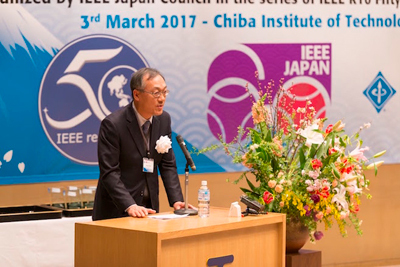 It has encouraged the spread of cross-generation and cross-technical fields communications throughout Japan IEEE members. Today’s workshop has clearly provided us with further improvement capability. Cilck to open the leaflet(pdf file). 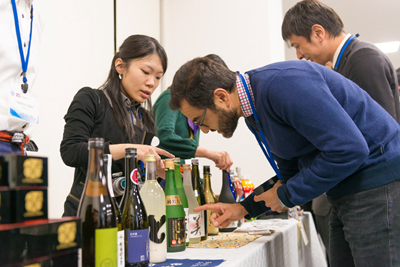 Local Sake Party and "Hinamatsuri"
Logo of "IEEE Japan Sections' 60th Anniversary Celebration" was designed with an emphasis on representing relationships between people through IEEE and Japaneseness. The logo is based on "Wachigai", one of Japanese traditional patterns, that is constructed of connected rings. The connected rings contain a wish for connection with people and continuous prosperity. The rings were retouched to signify a figure of "60". Central lower part of the logo represents Mt.Fuji which is the highest mountain in Japan, and the right ring was colored in red associated with the Rising Sun in the Japanese flag. 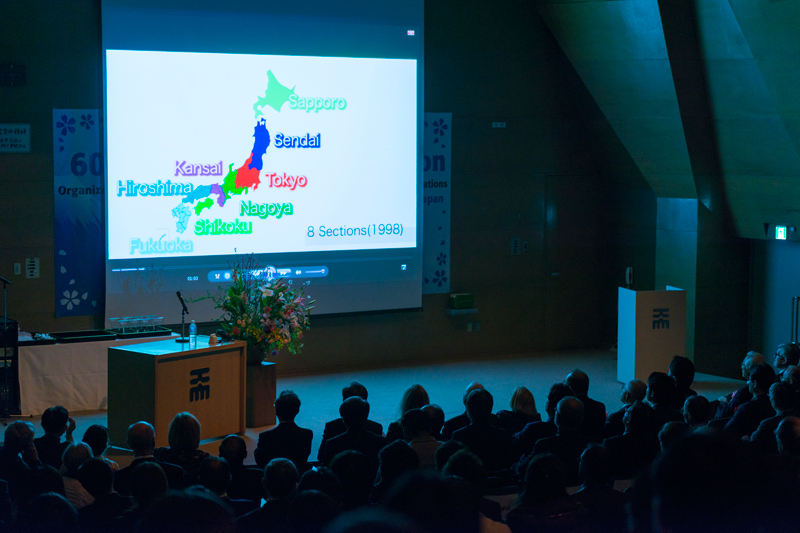 © IEEE Japan Council - All rights reserved.